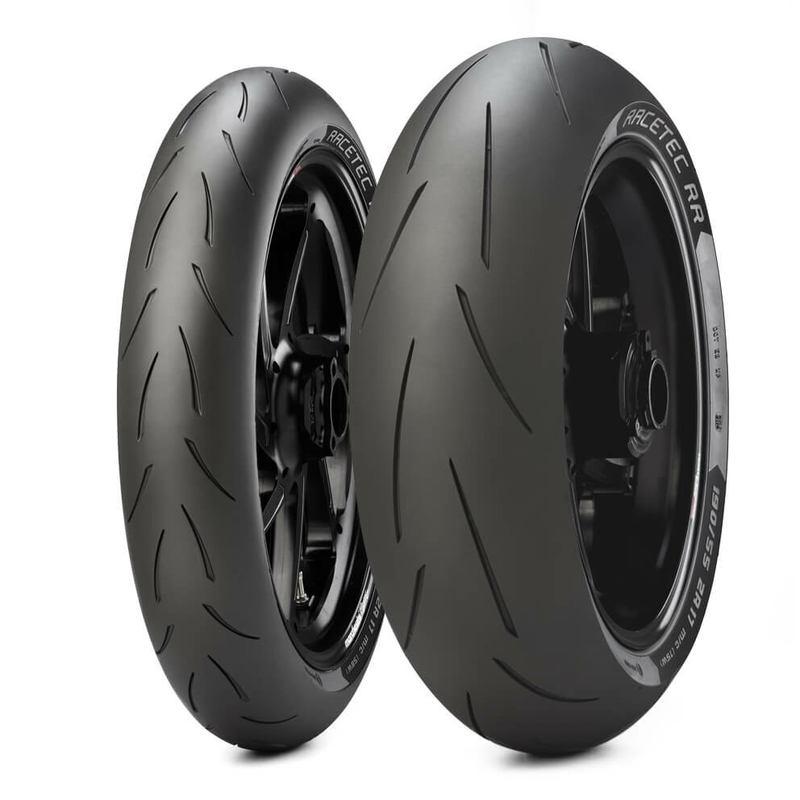 RACETEC™ RR Choose the Metzeler RACETEC™ RR tyres and discover the pleasure of driving safely and with high performance! 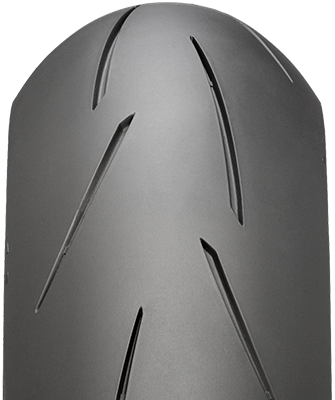 Road racing courses feature multiple and variable conditions and RACETEC™ RR compound specifications have been developed to cope with all of them. The compound recipes of RACETEC™ RR blend a selection of polymers and resins with different grades of carbon black to maximise hysteresis - even on slippery surfaces. RACETEC™ RR fronts conform to the micro-granularity of tarmac delivering more grip and wear resistance, to last longer on severe asphalt; the blend of polymers features also high flexibility at lower temperatures. 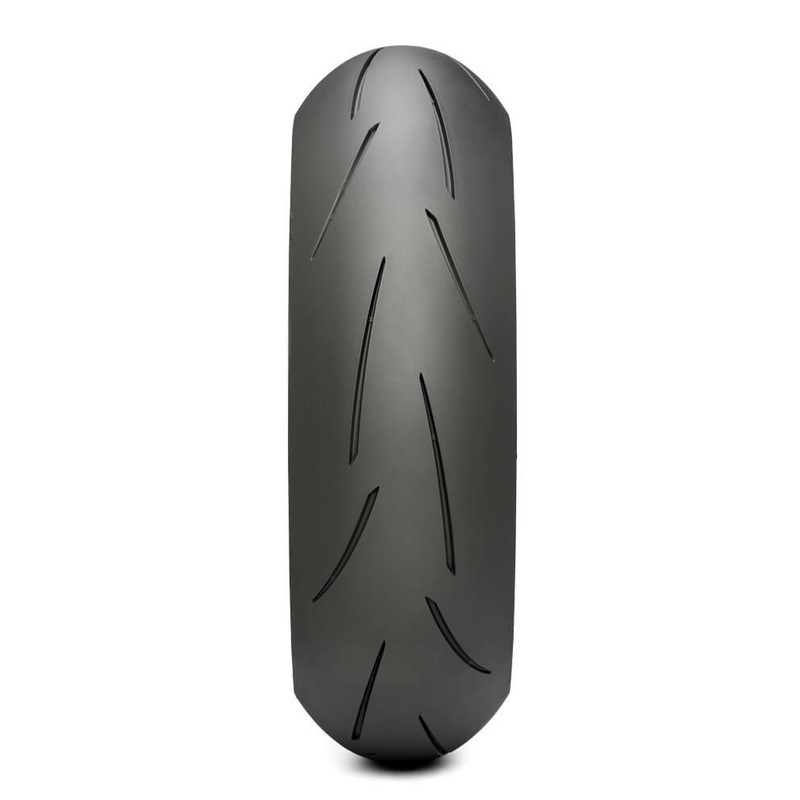 Thanks to RACETEC™ RR distinctive versatility of use on a wide range of asphalts and temperatures, the front tyre compound choice should be primarly made on rider’s preferences between higher stability and precision when entering the corner (K2 version) rather than predictability and “edge grip” feeling (K1 version). 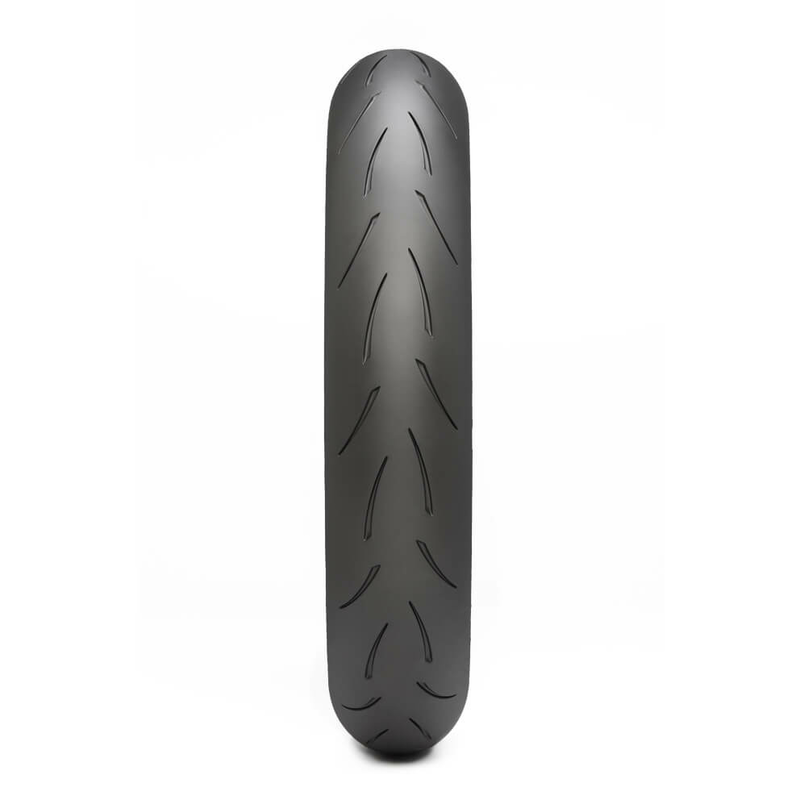 As for rear tyre, choice of version is based on asphalt friction coefficient (high severity/friction and low severity/friction, depending on the circuit or road race) and asphalt temperature (with the threshold being around 25°/30°degree). The dual-compound cap and base scheme of RACETEC™ RR rears feature a highly conductive center strip, which supports the shoulder compound from underneath and warms it up during long straights by redistributing the heat generated to the shoulders, maintaining them in the operative temperature and ensuring grip when going into lean. RACETEC™ RR features a composite structure, differentiated between the crown and the sides of the carcass to react properly to different circumstances. Stability is critical in road racing when riding on long straights at full speed (because of aerodynamic interferences) and when the bike passes over drain covers, repair patches or jumps. 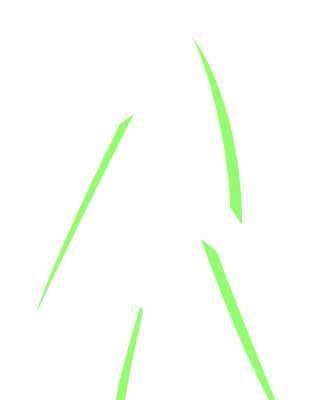 In both cases stability may be temporarily lost in the rebound following the bike quick lift and drop back down to the asphalt, compressing both tyres and shock absorbers. The crown structure is made with a special rayon fiber. 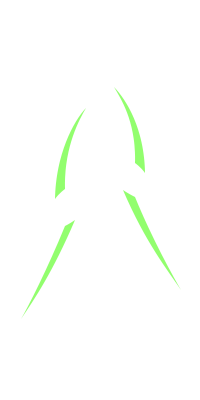 This is characterised by a high rate of linear density and stiffness and is capable of maintaining its shape under a high stress and load strain. The fiber further assists dampen the rebound stroke which absorbs the shock by distributing it through the whole carcass, and dampens the rebound while getting back to the initial shape. The side structure is designed to be stiff, with a low deformation ratio, so to sustain the entire architecture under stress, and to guarantee trajectory precision both on long fast and full lean. Road races sessions can last up to 240 km. (150 miles), which is more than three times an average track race; durability, integrity and performance consistency are keys to win. All the compounds of RACETEC™ RR range feature high resistance to abrasion thanks to a homogeneous dispersion of the components in the polymeric matrix obtained through our exclusive and patented continuous mixing process. The tread groove layout minimises the wear and also to disrupt the forces which crease the compound, known as Schallamach’s wear waves. 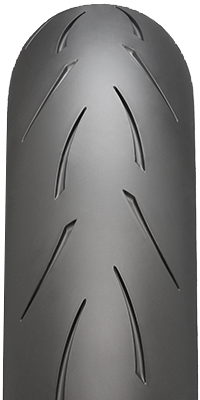 The disruptive angle of RACETEC™ RR grooves are the result of advanced analyses based on road racing activity.